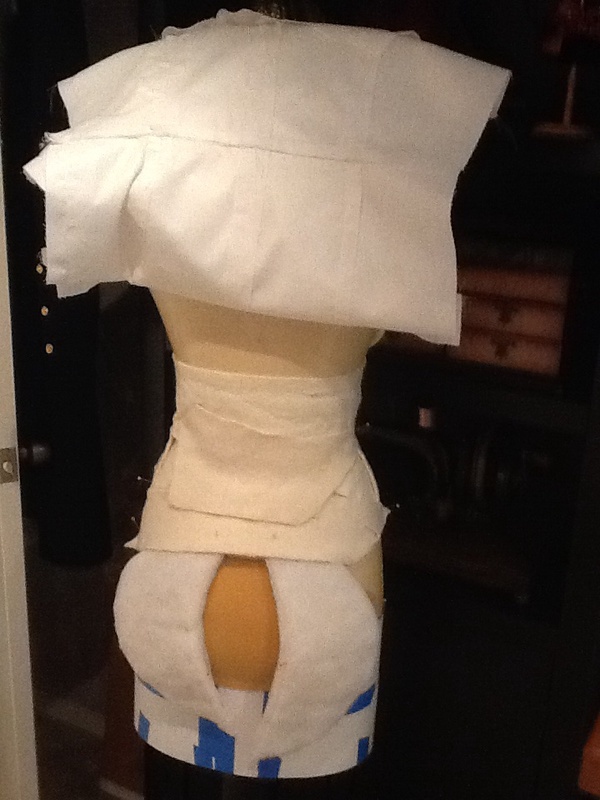 The bodice sloper and moulage are the same class. First you will learn to draft a moulage from your measurements. This fits like a second skin. 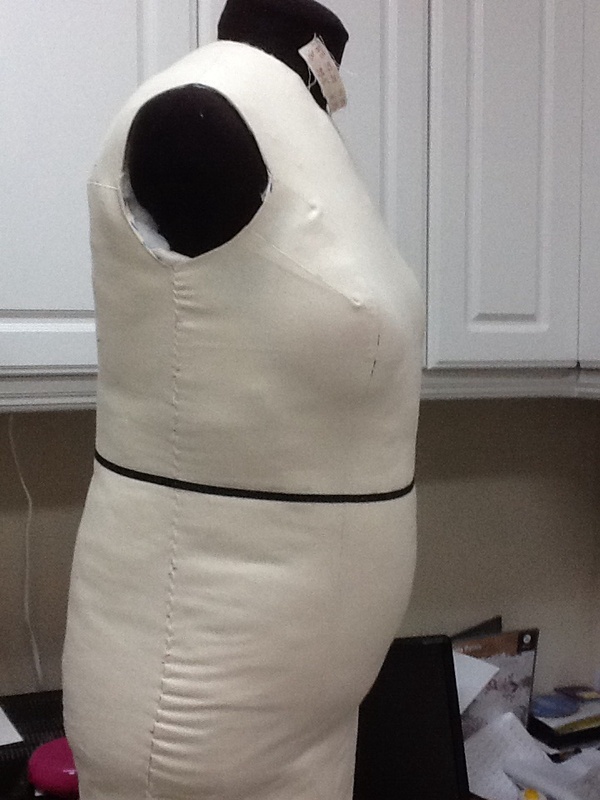 Suzy then shows you how to to make adjustments to the moulage to obtain a sloper custom made for your body. The sloper has ease and the armhole and neckline are lowered so you don’t want to use the sloper for your form cover; the resulting form will be larger than you. Use the moulage. I was able fit it on myself by leaving a one inch seam at the center front open. That way I could pin it closed without help. Adjust your form so the shoulders, cross back and cross front measurements are as close to yours as possible. 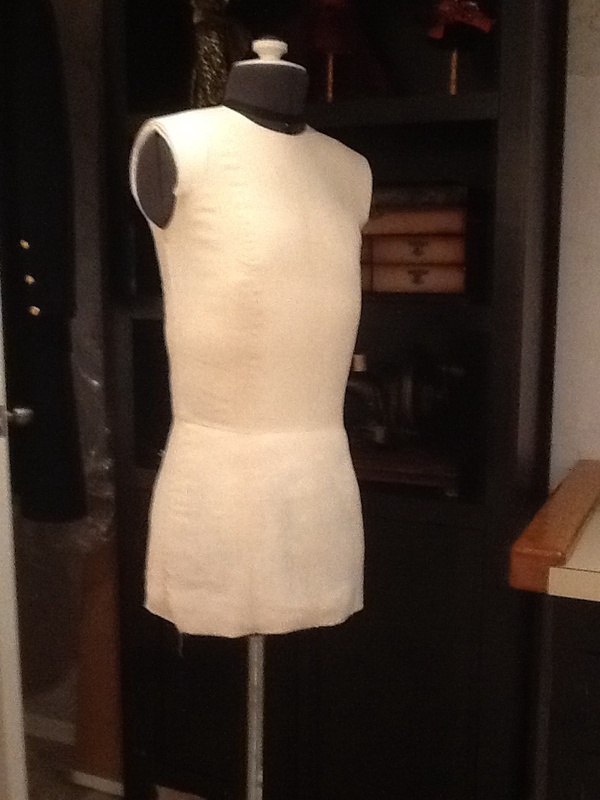 I would make the bust, waist and hip slightly smaller. Don’t worry if those areas need extra padding. The padding will also fill in the gapd between parts of the form and cover the indentations around the dials. The Fabulous Fit pad set will help you get started. Put the completed moulage on your form and note where and about how much padding is needed. Photos also help. Quilt batting works great if you cut it into long strips 2-3 inches wide and wrap like an ace bandage. 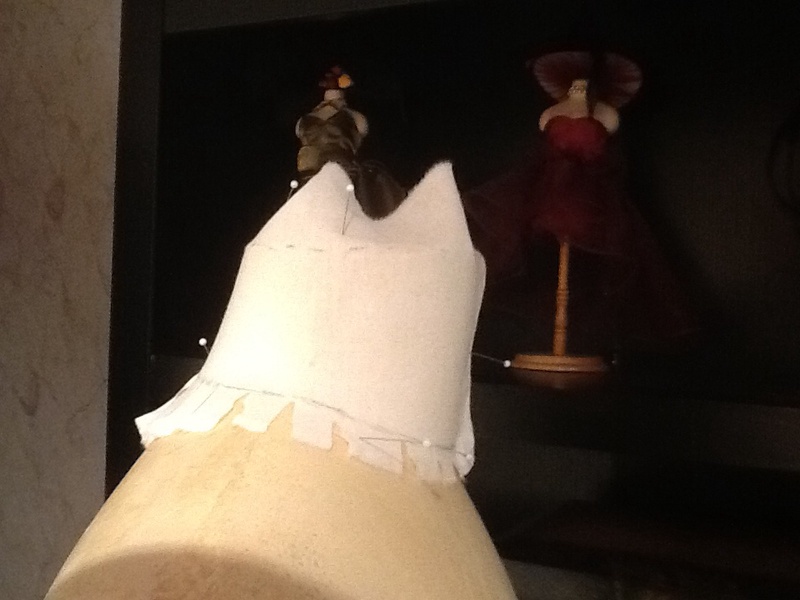 I used upholstery batting for the final layer as it feathers very easily and hides the edges of cut batting. I tried tearing the quilt batting to produce a soft edge but the bonding prevents you from doing this easily. Let me know if you want to try the upholstery batting and have trouble locating a source. Good luck and I would love to see your results. Please send a note if you need advice and I’ll try and help. Good luck and I’m sure you will enjoy having a replica of your body. Thanks for sharing this. I have a old dial up model and have Suzy’s class. Haven’t got so far as to make a moulage. Eventhough my dress form is the smallest it is still too large around the upper chest so I haven’t gone so far as to pad the rest out. Try dialing it to smallest setting and see if you can overlap the parts to get it small enough. I did this with the petite figure I did and was able to compress the form enough to work. Hold the compressed form and put some twill tape around to hold it closed. This might take two people. Good luck. If you can’t get it small enough look into a child’s form and pad out. Good luck. If you want to send me measurements I’ll see what I come up with as an option for you. This is fabulous! Thank you for sharing your experience. I agree that measuring is the hardest part. I’ve heard good things about the Uniquely You dressform, being that it is compressible foam, it fills out a moulage without padding. I think that is the form that has different size covers that can be adjusted for your shape. The biggest problem with the non-professional versions of dress forms is that the stands tend to be lightweight allowing the form to tip easily. Check that the UniquelyYou form has a solid base. Let me know how it works. Thank you so much for posting this. 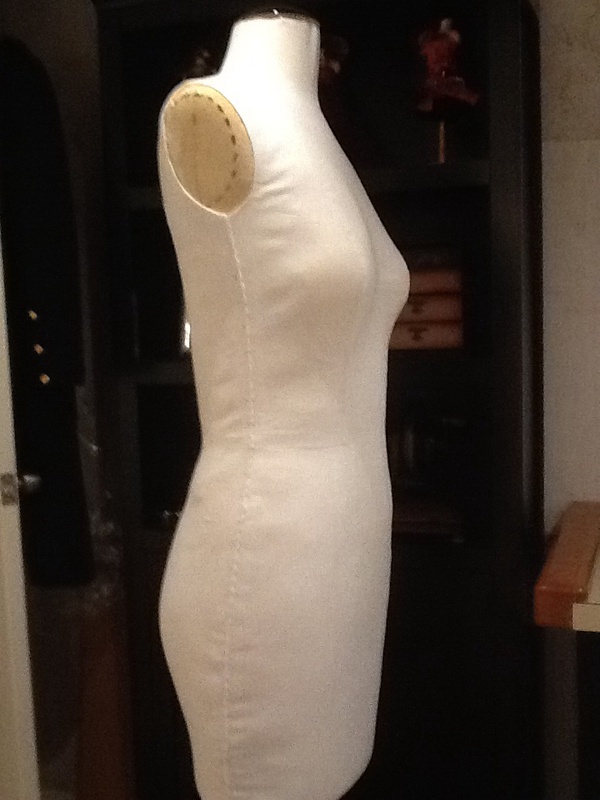 I have been researching a way to make a custom dress form for months now and yours is certainly the most successful method and the least toxic, I might add (avoiding polyurethane foam)! I am taking Suzy Furrer’s class, also. I’m having trouble finding non-bonded batting. Is it advertised as “non-bonded” or should I just look at all batting and see if it does NOT say “bonded”? Thanks again. You want upholstery batting. Try garysupholstery.com. Click on products, then on upholstery supplies, then on cotton batting. It is $4.99 a yard. Two yards should be plenty. One might do it depending on how much padding you plan to add. It does pack down so overstuff and use your moulage to compress. Let me know if you have additional questions. I absolutely love my custom form. Just to add to the discussion. I have a long torso and needed to lower the bust apex. 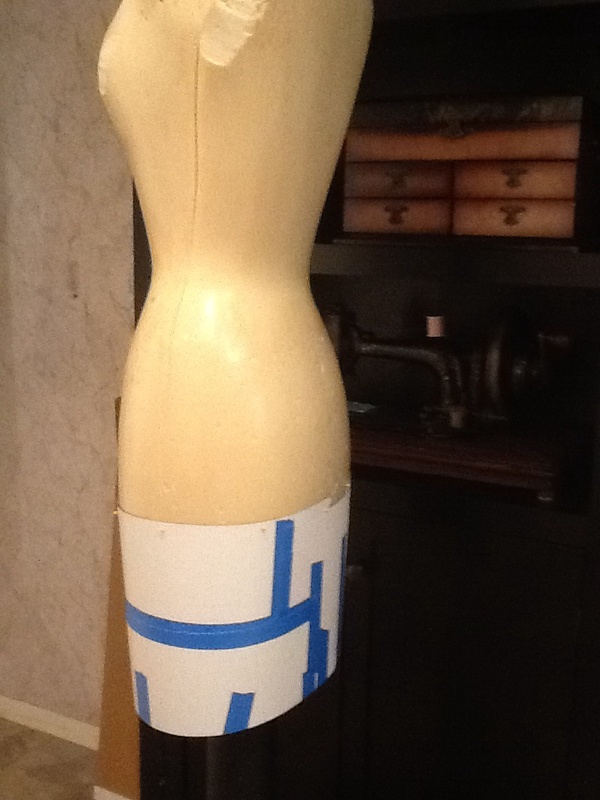 This was done quite easily on a plastic adjustable dress form by cutting of the bust -level with the torso. 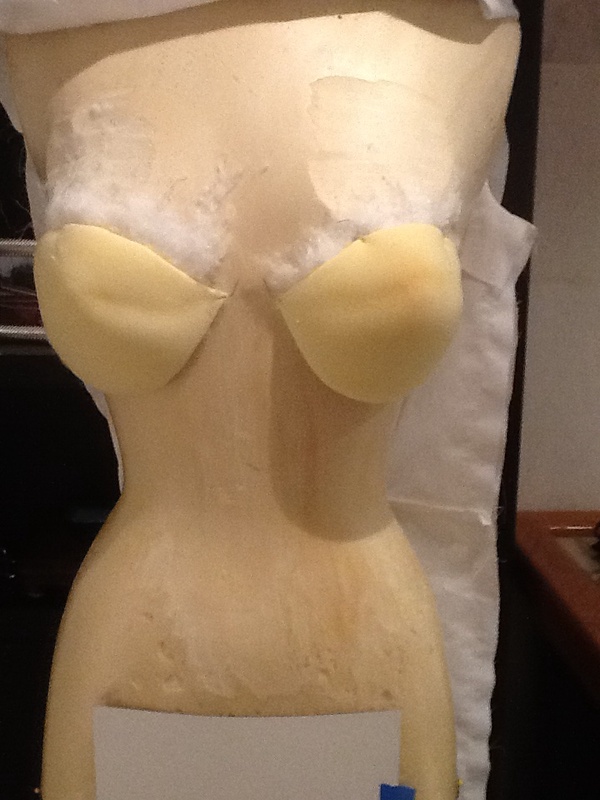 Taped cardboard over the holes and then proceeded to pad out the torso with bra and wadding etc, held in place with elastic crepe bandages, basted to hold closed at the end. That way I can pin into the bandages easily if needs be with no sticky residue as happened when I used tape to hold everything together. Glad you found a way to customize. Having a pinnable duplicate of yourself is so helpful. Another great post! Now I really want to pad out my dress form to my measurements. That would certainly make fitting a lot easier. You will not regret the time spent doing this. 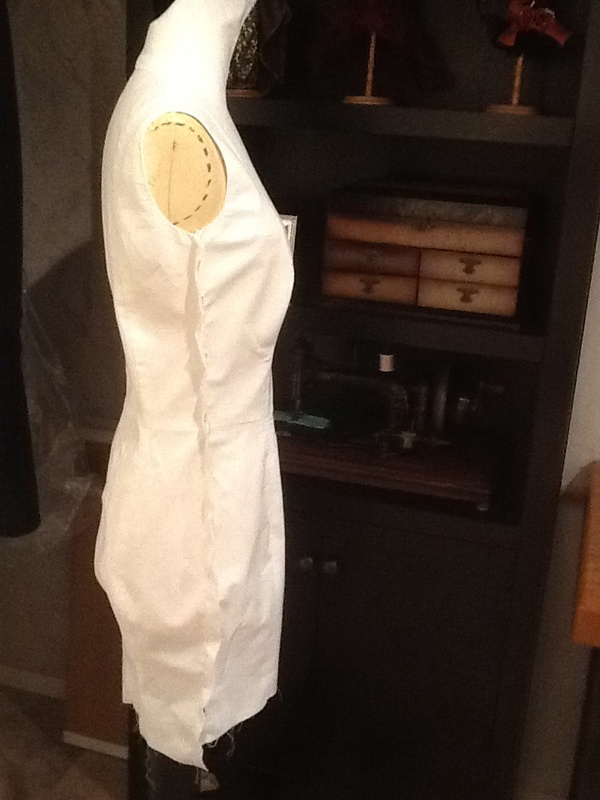 I’ve found having a body double dress form invaluable in fitting patterns and drafting. Having this tool will elevate your fitting skills. 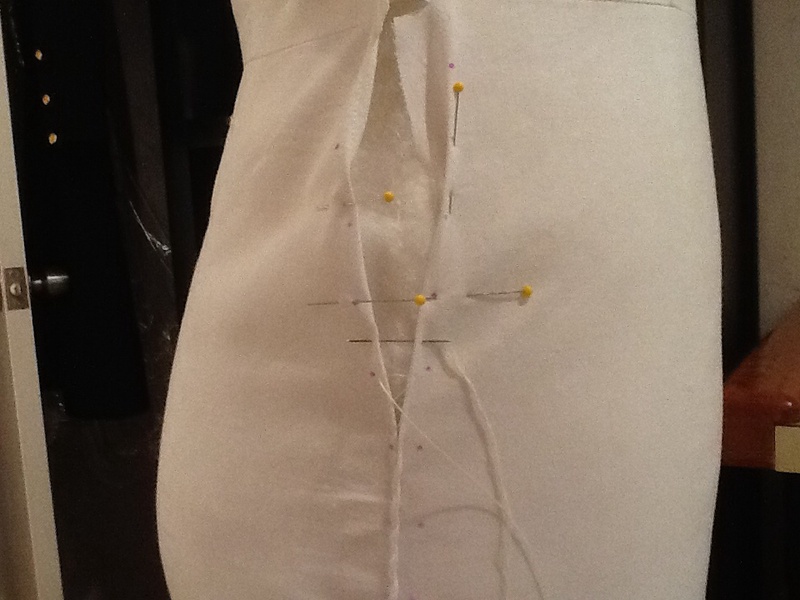 Being able to put the garment on a form and evaluate the fit is so much easier than contorting your body. Glad this was helpful to you. I think customizing a slightly smaller form is best because, like you said, the cover can be modified if your shape changes. Enjoy your new form and I’m sure you will appreciate how much easier fitting becomes.